Buy the Mo-Rod and Mo-Reaper combo and save $20 + Free Shipping on this item. Early 580 series with pencil barrel. 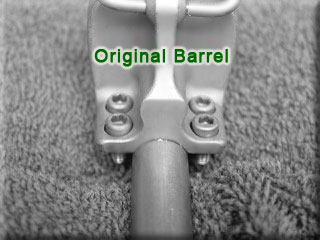 This model requires that you order Mo-rod and Mo-reaper for standard pencil barrel and requires that you cut a new roll pin slot on your barrel for proper fitment of the Mo-reaper. Finally! …A quality-built hooded front sight for the Ruger Mini-14 Rifle, integrated with a precision-designed muzzle brake, is now available from the makers of the famous Mo-Rod Barrel Stabilizer. 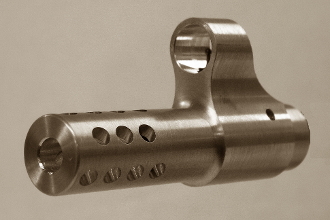 The Mo-Reaper’s unique lateral port design redirects muzzle gases away from the shooter, providing for superior recoil control. Constructed from lightweight, high-quality, hard-anodized 7075 T-6 Billet Alloy for reduced weight and superior strength, the Mo-Reaper utilizes the same roll pin location on the barrel as the factory front sight, making it a ready-to-fit accessory. The Mo-Reaper’s alternating rows of gas-dispersing ports limit muzzle rise, while maximizing noise deflection. 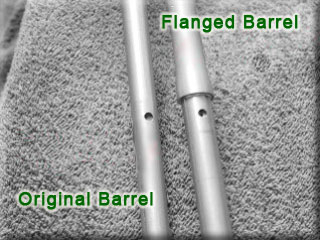 It disperses gas and sound equally to both sides, but will not blow gases downward, thus eliminating the irritating dust cloud when shooting from the prone position. For an extra measure of rugged protection, the Mo-Reaper is finished with an industrial-grade hard-anodizing treatment. The Mo-Reaper enhances accuracy by providing the shooter with a pin-point sight picture that does not obscure the target like the thick factory front sight, allowing for lightening-fast target acquisition and engagement. The complete cylindrical hood feature keeps glare off of the perfectly centered ball-type sight post, providing an outstanding sight picture. 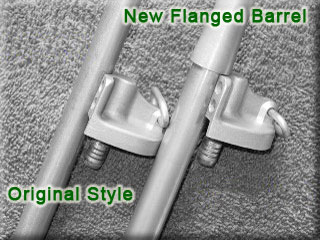 Standard AK/SKS threads allow the sight post to be easily switched, providing for a variety of sight options. Available in natural alloy brushed silver (for stainless look) or satin black. Mo-Rod/Mo-Reaper Combos come with the appropriate 5.5" Mo-Rod with the exception of the Mini 14 Tactical Combo which comes with a 4" Mo-Rod.